Note: This paragraph is an update to the below story that was originally posted on walkingclematis many months ago. The Phat Sandwiches restaurant has moved, effective Tuesday May 26th, 2009, to 106 N. Olive Avenue, just 1/2 block north of the 200 block of Clematis Street. 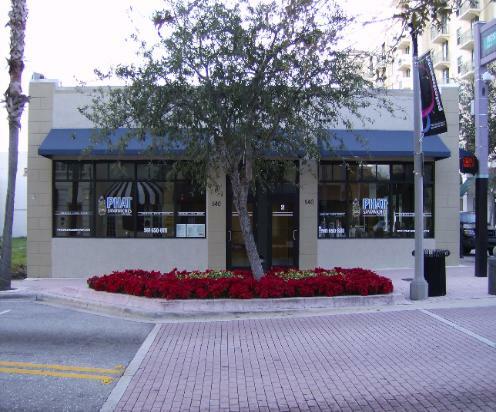 The restaurant owner and the building owner could not reach a meeting of the minds regarding a new lease agreement, so the restaurant decided to move, but not very far away (just three blocks to the east down Clematis Street). Phat Sandwiches will continue to serve the same great food, just from a new location. It is now going to be just around the corner from all the other popular restaurants on the 200 block of Clematis Street, like Rocco's Tacos, Grease Burger Bar, and Clematis Social. In the meantime, Phat Sandwiches will certainly be missed on the 500 block of Clematis. Hopefully something else great will move into the former site of Phat Sandwiches, pictured below. Almost two years ago, a sign appeared announcing a future business on the 500 block of Clematis Street (at the corner of Clematis Street and Rosemary Avenue, just across from the 610 Clematis condominium). During my daily walks by the site, I would sometimes see activity such as workers, etc. The future owner Dan Rubin was often there directing things and I would ask him when he was going to be open. He would always answer with a sigh, indicating a certain amount of frustration with the long drawn-out process of starting a new business. Apparently the City of West Palm Beach permitting process is quite demanding (this may well be an important protection to the public as many new businesses are going into older buildings on Clematis Street). At long last in 2008, the Phat Sandwiches business opened its doors for lunch. The new corner restaurant has been decorated in a very attractive manner. At first, it didn't appear that the restaurant had very many customers. As the months went on and word got out, Phat Sandwiches began to attract a very loyal following for lunch. They do a brisk business both for walk-ins and for the downtown delivery crowd. After a few months, I decided to try their Cheesesteak Panini sandwich, which like most of their orders is served with salad and pasta in addition to the sandwich. This has become one of my all-time favorite meals. The combination of the extremely soft meat along with the delicious cheese and flavoring makes this sandwich absolutely delicious. For me at least, this meal is only recommended when I'm extremely hungry, because it's normally too big for my stomach, and well worth the $9.95 for someone with a hearty appetite. The owner Dan Rubin is very friendly, and he is always there taking orders, serving, and helping out. It has taken a lot of work to get established on the 500 block, where lunch traffic was previously not particularly heavy. However, this location has a lot of future potential, being on Clematis Street and Rosemary Avenue (which leads into City Place to the north). The Phat Sandwiches business is hopefully the first of a long line of businesses to discover this promising hub.